Markets served: Upstream oil & gas, Downstream oil & gas, Petro Chemical, Power Generation, Shale Gas, Chemical, Mining, Desalination, Nuclear. 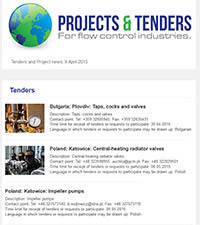 Projects and Tenders is a subscription based online newsletter which provides the latest updates on a variety of world-wide tenders, projects, expansions contracts and acquisitions for Valves Pumps Stainless Steel piping and related products for the flow control industry. Divided into two sections, the first focusing on tenders and the second on news, it provides the latest updates on a variety of worldwide tenders, projects, expansions, contracts and acquisitions. Subscribe today on our webshop and don't miss an issue! Content submissions: Candace Allison, c.allison@kci-world.com and Melanie Gogan, m.gogan@kci-world.com.